Why are we collecting? : Each piece of plastic that we throw ‘away’ ends up in landfill or incinerated in a linear way, that plastic then has no purpose or value to anyone, but by recycling, we put that plastic back into the cycle of purpose and value and we save energy, resources and our planet by doing so. Where does the waste go? TerraCycle collects the waste free of charge and turn the then organised waste into sellable plastics and create multiple upcycled items including bags, stationary, benches, watering cans and many other useful everyday items. What’s in it for you and us? By choosing to recycle the otherwise non-recyclable plastic we are making a difference to the amount of pollution caused globally, reducing the number of plastics in landfill/incinerated, we save energy and resources, we rethink our personal use of plastics and we do the right thing! 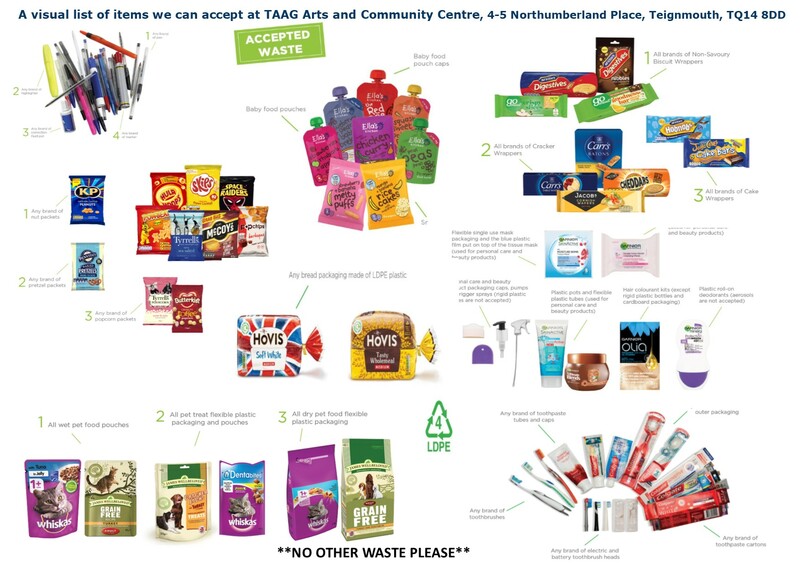 TerraCycle offers financial incentives for charities or schools of the collectors choice and we have chosen Teignmouth Community School (TCS) to be the benefactor of the incentive. Why TCS? We are working closely with the students and staff of TCS on a mission to reduce the plastics in the school environment, encouraging enterprise and fostering innovation for a long term goal of reducing plastics in our local and home environments, the school have already implemented the collection of the Terracycle streams, created a student green team and as a reward for their hard work we would like the school to be the benefactor of the incentive received.